We are traveling around the country for a year (Aug. 2014-2015 or longer*) to visit friends and family, visit National Parks and tag states we haven’t been in, and to decide where we want to live next. We like it hot and sunny, although we do like to ski. Ideally, we agree, our perfect place will be Someplace Warmer and Cheaper Than New England…we want palm trees and skiing within a couple hours, so the southwest is high on our list. We can do this trip at our “younger” age than the majority of full-time RVers because I am a freelance science writer and Mitch is a business consultant to early-stage IT companies. We both are self-employed and can work from anywhere we have internet and phone. Mitch and I have known each other for several years, and have been a couple since June 2012. We met on the sidelines of our boys’ baseball games. We have three boys between us from past spouses (he has two and I have one — children that is). The youngest two boys both graduated high school in 2014. We both have dreamed of doing a year-long RV trip like this since long before we were a couple. Knowing our two youngest children were both going away to college at the same time, we made the easy decision to sell our home, sell the cars, put a lot of our stuff in storage, buy an RV and make the dream a reality. After an exhaustive search, we bought the RV brand new from a Camping World dealership in Gulf Breeze, FL, in July 2014. It’s a well-understood irony that brand new motor homes require a long breaking in period and a lot of service and warranty work the first six to twelve months. It’s not just a bus-sized vehicle, nor is it just a home, it’s a bus-sized home that gets bounced and jiggled and jolted around until every screw and moving part works its way loose, no matter how hard they tighten it or bundle it up at the factory. 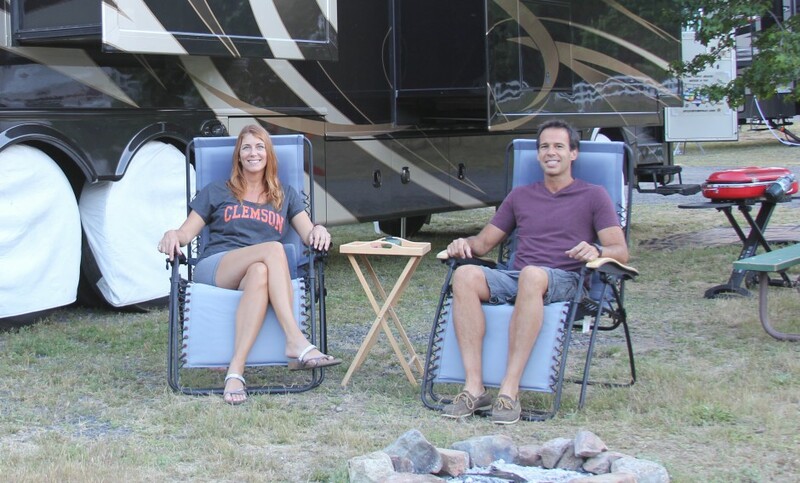 Our first night, we camped at a beach campground near the dealership in late June, and made a punch list of two dozen items to be repaired or addressed at Camping World, where we left her for six weeks. 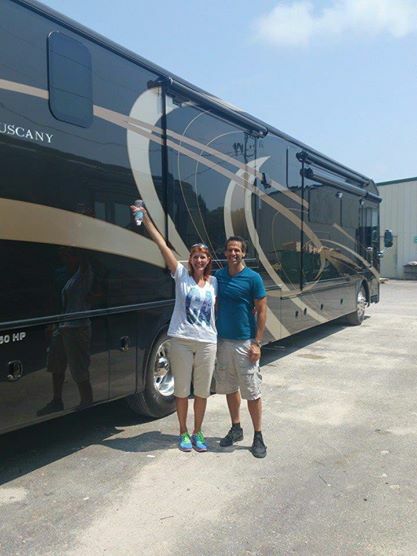 Then in late July 2014, we flew one way to Pensacola and drove the RV home to Massachusetts to equip it with everything we need to live and work in it for a year. Our RV has a desk and two computer work stations. We have a Pantech (now Verizon in 2015) Millenicom mobile hot spot that provides internet everywhere we go, even while on the move. First on our itinerary was dropping off my son, Richard, at Clemson University in Clemson, SC, for his freshman move-in day on August 16, 2014. Then we spent a weekend in northern Georgia with friends and headed down the highway toward Salt Lake City, Utah, where Mitch’s son, Greg, was starting his freshman year at the University of Utah (he’s a snowboarder). We officially started our new life as free birds in Utah, visiting Val’s childhood friend, Jean Marie, in Park City, and then proceeded to Reno, Tahoe and Vegas. We kept going from there. Whoo-hoo!! I blog about our travels and adventures and would love to have you follow me on facebook (RVluckyorwhat), twitter @RVluckyorwhat, Instagram, Pinterest, Trover, RVillage, etc., and here on WordPress. *Update: May 2016 — Our travels are now going on our third year, and we have slowed our pace considerably. In year two, we revisited the places we liked but didn’t get enough of the first year, and we now usually take a week or two at every location. We plan to “shelter in place” in Palm Springs for the winter of 2016-2017, possibly with a plan to set-up long term. We may even start house hunting. Stay tuned! To subscribe and receive future posts via email, use the widget on the right. Read my next post here! Hi Cyndi & Pete! I can’t wait to see you. It’s been too long! Is it necessary we sign up with “rvLuckyorWhat” to continue to received delivery of your new post?? Hi Rick! Yes, to receive notice via email whenever a new blog post is published, you have to jump through a hoop or two, by using the widget I’ve posted to the right of my blog.